one more unreleased MUSLIMGAUZE announced by french arabbox! it's free from start. "Time to come out of the old dusty box for an album by Muslimgauze named 'Wish of the Flayed' that has for a long time remained under wraps. Bryn Jones himself gave this album on cassette tape to Steven Wilson (Bass Communion) during their first meeting on the 3rd of june 1996; the album having been recorded the day before. 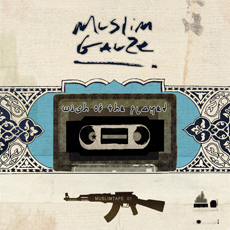 (One day for making a whole album is not so surprising for Muslimgauze..). The master DAT had, seemingly, not been sent to any label, so this recording is the only proof of the existence of the album. The sound quality not being of the usual standard for a CD release, Steven and I, with the agreement of the Soleilmoon label, have decided to make this tape available in mp3, free to download for everyone. I hope many people will enjoy this initiative, the aim of which is only to show, once again, the genius of Muslimgauze's music. Two tracks were used with different durations on the album 'Fatah Guerilla' (first and last tracks), the others being totally exclusive."